Guest blogger Anne Dudley shares a few of her favorite, Cavegirl-friendly summer dinner ideas. When it’s too hot to cook, quick and simple salads save me from splurging on to-go meals, or eating shakes and smoothies for dinner every night. Having a few different fresh veggies in the fridge each week means I can get in and out of the kitchen fast and never make the same meal twice! This summer, I’ve been able to source most of my produce from our local farmer’s markets, which really makes a difference in the freshness and flavor of the veggies. 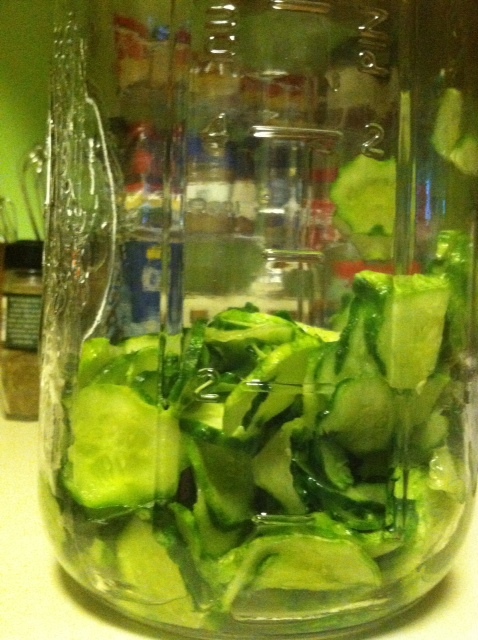 I don’t normally do this… but my homemade pickles are so good, I threw them on my salad and was pleasantly surprised. I followed a recipe similar to The Preppy Paleo’s, but there are plenty of recipes online, and with plenty of fresh veggies in season, it’s the perfect time to pickle! Like many primal eaters, I try to keep salad dressing simple, so the vinegar based pickles add a little flavor that pairs well with the vinegar and oil dressings I make myself. In the summer, squash is plentiful, affordable and filling. Between the market and friends and family’s gardens, there just always seems to be so much of it to use. This week I bit off a bit more than I could chew at the farmer’s market and ended up with too much squash. 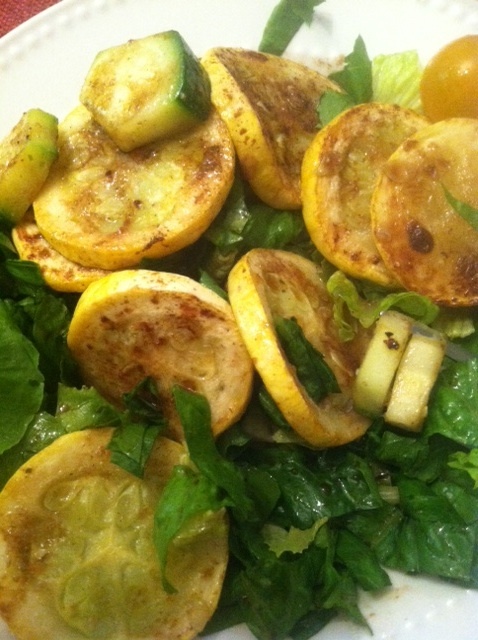 For a quick salad, if you start by cutting up the squash and putting it in a pan with your favorite oil (coconut oil for me – which I usually find on the cheap at Target), you can have the rest of the salad chopped and ready by the time it’s done. I chose two varieties of lettuce at the market, small cucumbers, and a beautiful mix of yellow, orange, and red grape tomatoes to liven it up this week. It doesn’t just happen at Chipotle! Paleo folks go back and forth on rice, but I think Mark’s Daily Apple does a great job explaining the benefits and drawbacks of eating rice occasionally. Every now and then, I add rice to a salad, especially when I am having a highly active week and feel like I’ve earned it. It feels like a treat and you can set and forget (and portion control) in the rice cooker. And while you’re having fun in the summer sun, don’t forget Primal Life Organics’ sun protection products — Sun-Up and Sun-Down! 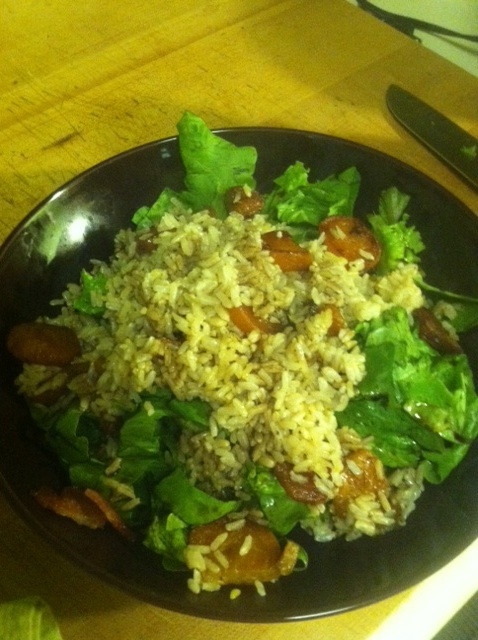 For this salad, I fried bacon and leftover baked beets, sliced and cooked in the fat. I tossed the lot with a little balsamic vinegar, salt and pepper and added it to a romaine salad. As a born lover of dessert, I’ve baby stepped my way and tricked myself into opting for healthy and semi-sweet, and Paleo friendly options. 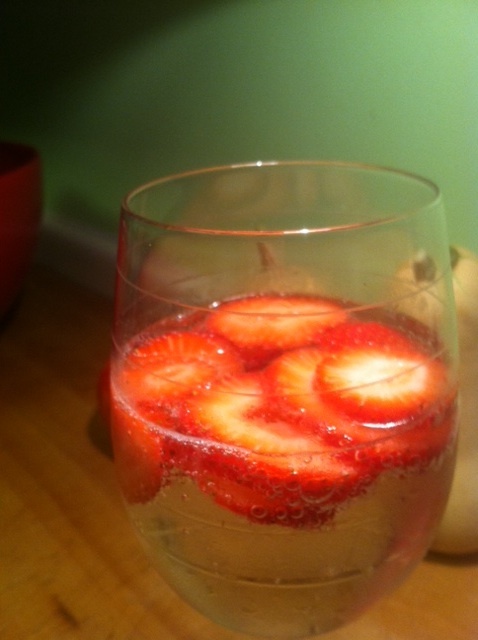 To beat the heat, I sliced fresh strawberries into chilled seltzer water and put them in a fancy glass. It’s just enough sweet crispness after a long day! Keep your skin healthy and safe this summer with great Paleo tips and recipes from CavegirlSkinCare.com and our newest additions – Sun-Up and Sun-Down. Learn more about primal skincare PrimalLifeOrganics.com.